Look at how magnificent this historic landmark of London looks, lit up for this grand wedding of Arjun and Lucy. 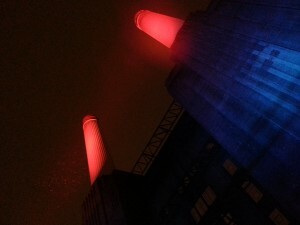 Battersea Power station was originally a coal-fired power station in the 1930’s, but years on it became a derelict building in the early 80’s; who would of thought this would become a site for two London Dhol Players to be performing at a fabulous asian wedding. This is the first time we have performed here and what a thoroughly enjoyable wedding it was. Arjun arrived in a white ‘Ambassador’ car with other guests joining him in a very colourful wedding bus. 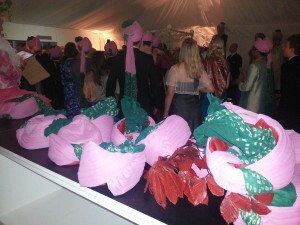 Arjun and his Bharaat were dressed in these colourful turbans and danced their feet off down the walkway upto the venue entrance where Arjun met Lucy and her family for a garland ceremony. Even though the weather was terrible on Saturday, Arjun and all his family sent echoes through the four chimneys of the power station as they went full steam ahead by partying their way into the wedding very elaborately; they were a truly energetic bharaat! A great first wedding at this extravagant wedding venue.